Phytocannabinoids have been extensively used throughout history for various therapeutic purposes, particularly analgesic. Compelling evidence has shown that cannabinoids decrease allodynia both thermal and mechanical, proving their role for treating neuropathic pain. 2) Chronic pain & cannabinoids: how can cannabis help you? Nociception (pain perception) is a critical mechanism of the body self-defence, inducing to discontinue a stimuli potentially deteriorating. It has been estimated that 7-8% of the entire population of Western Countries develops neuropathic pain, which is often caused by other pathologies (cancer, diabetes, MS, HIV or stroke, just to mention a few). Despite the aetiology of the disease is multifarious, it causes the nervous system to be hypersensitised due to prolonged impulses. Chronic pain & cannabinoids: how can cannabis help you? Moreover, the medicines that activate CB1 receptors maintain their efficacy, at the opposite of morphine, which is less potent over time (so that more doses are needed, and with it, an increase in side effects). Opioids are prescribed worldwide to deal with pain. Only recently Sativex has been approved for treatment of pain in some European Countries! If you want to know more on legalislation, click here. Here are some facts, all the side effects for both medications. Remember that researching cannabinoids medications does not necessarily mean using THC-based medications and lots of research is going through in this direction, making cannabinoid-based drugs even safer and non-psychoactive. Notice that some of the effects reported for cannabis, are not “unwanted effects” by patients, such as bronchodilation, aid sleep, easing cramps, anti-inflammatory properties or antispasmodic, we report them for comparing them to Morphine. Did you like this article on chronic pain & cannabinoids? Scadding, J. (2003). 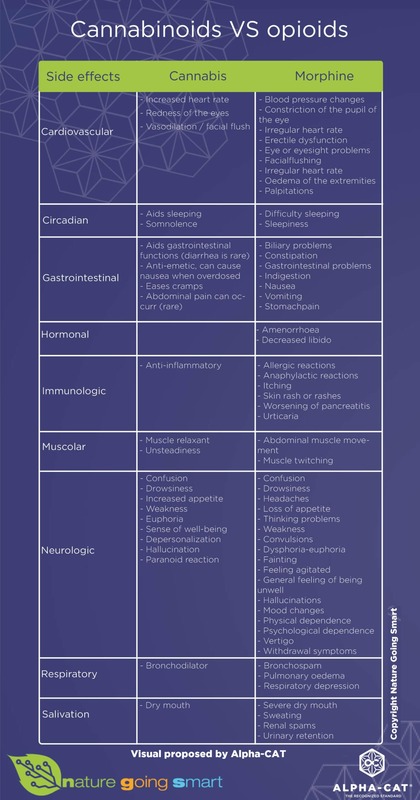 Neuropathic Pain.ACNR. 3 (2), 8-14. Selph, S Carson, S Fu, R et al. (2011). Drug Class Review Neuropathic Pain.